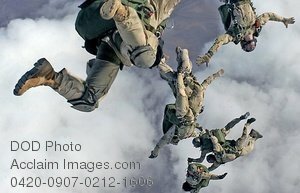 Description: Free, public domain image: Military Pararescuemen Jumping from a Helicopter. Pararescuemen jump from a HC-130P/N for a high-altitude, low ppening free fall drop from 12,999 feet in support of Operation Enduring Freedom. The Airmen are assigned to the 38th Rescue Squadron and the 58th Rescue Squadron from Nellis Air Force Base, Nev. (U.S. Air Force photo/Staff Sgt. Jeremy T. Lock.